bethquinndesigns: She is Ready to Begin 2009!!!! I had a wonderful year in 2008, but I am now ready to begin 2009 !!!!!! I am looking forward to new exciting adventures in the next year - I have some wonderful things I am working on and lots of new jewelry !! SO I wish everyone a year full of exciting new things, creative dreams and wonderfilled moments !!! Welcome to 2009 !!!!!!!! Your year in review is Beautiful!! I can't wait to see what is new in 2009!! I am so darn proud of you Beth!! Your talent is extraordinary and 2009 will rock for yu!!! Hi Beth, I just wanted to stop by and say hello and I hope you have a Happy, Healthy and Creative New Year. I always enjoy seeing what you have new! Just wanted to wish you and your family a wonderful New Year!!! Happy New Year Beth, I can't wait to see your new creations. I am loving the picture of the dolls head with the blue box. I found a head like that and arms and legs at a flea market a few months ago and still haven't figured out what to do with them. p.s. please send me your address so that I may mail you your gift. Congrats on your recent publications and a creative new year to you! I received the most beautiful She necklace for Christmas. Happy New Year to you!! 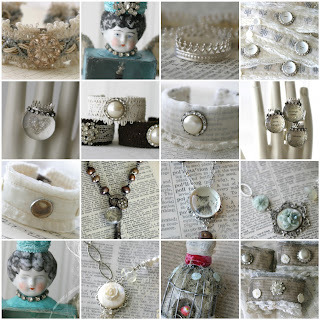 I just found your blog via Deryn's and it is just beautiful! I've saved it to Favorites already:-). I think the only publication you didn't get featured in 2008 was Time magazine! I hope 2009 is even more of a success for you! I love it all! You have such a pretty whimsy style! Happy New Year, Beth!! Can't wait to see you new creations!! I adore everything you make!! I love all your pictures and I can't wait to see the new things you come out with in 2009! I love your review. Splendid.